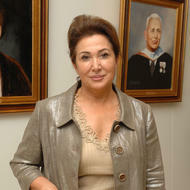 Mrs. Maha Kaddoura ‘70 sits on the Advisory Board of the Lebanese American University (LAU) and was awarded the Woman of the Year Award. Mrs. Kaddoura has set-up the Kaddoura Family Foundation, also known as the Kaddoura Association for Philanthropy, which she heads and that caters to educational needs and to the needs of (mentally and physically) handicapped children. She also built a nursing home for the elderly. Mrs. Kaddoura received a B.A. in Political science from LAU and an MBA from the Harvard Kennedy School of Government. She is a member of the Board of Trustees at Tufts University, within the Fletcher School of Law and Diplomacy where she helped create the Middle East Studies Program. She is also a member of the Dean’s Council of Harvard Kennedy School of Government, as well as a member of the Advisory Board of the Institute for Historical Justice and Reconciliation. She was a member of the board at the Woodrow Wilson Centre and Aspen Institute in Washington, D.C. and was the Chair of Advisory Board at Amideast in Lebanon. In addition, she was a member of the Harvard Club in Monaco. Maha Kaddoura is also a Member of the American University of Afghanistan. She has long been a supporter to LAU and to education.